Syndication — the process by which material from one site is published automatically to another site — can create confusion for readers who don’t understand it. It’s a often case where something is coming from “upstream” but appears not to be. 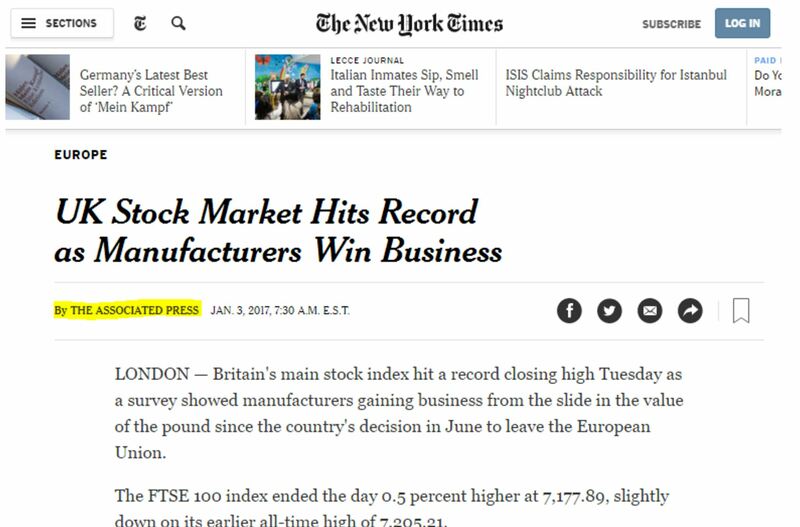 We see a set of stories on the left (“Germany’s Latest Best Seller”, “Isis Claims Responsibility”) written by New York Times staff, but also a thin column of stories (“UK Stock Market Hits Record”) which are identified as being from the Associated Press. If you are going to evaluate the source of this article, your evaluation will have little to do with the New York Times. You’re going to focus on the reporting record of the Associated Press. People get this wrong all the time. One thing that happens occasionally is that an article critical of a certain politician or policy suddenly disappears from the New York Times site, and people claim it’s a plot to rewrite the past. “Conspiracy!” they say. “They’re burying information!” they say. A ZOMG-level freakout follows. It always turns out that the article that disappeared is a syndicated article. AP articles, for example, are displayed on the site for a few weeks, then “roll off” and disappear from the site. Why? 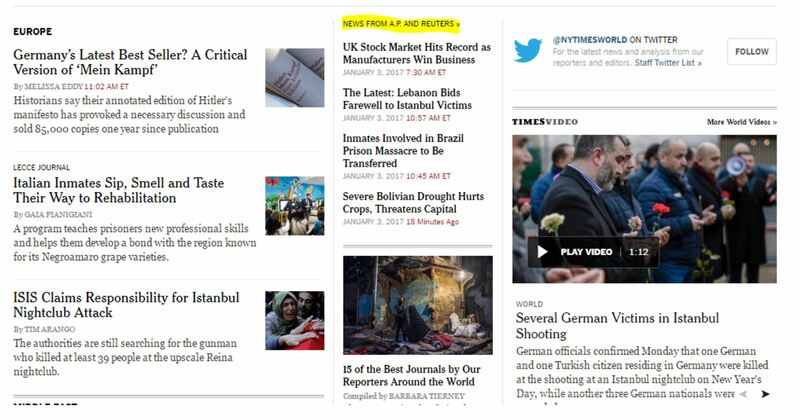 Because the New York Times only pays the Associated Press to show them on the site for a few weeks. You’ll also occasionally see people complaining about a story from the New York Times, claiming it shows a New York “liberal bias” only to find the story was not even written by the New York Times, but by the AP, or Reuters, or some other syndicator. Going upstream means following a piece of content to its true source, and beginning your analysis there. Your first question when looking at a claim on a page should be “Where did this come from, and who produced it?” The answer quite often has very little to do with the website you are looking at. Understanding Syndication Copyright © 2017 by Michael A Caulfield. All Rights Reserved.